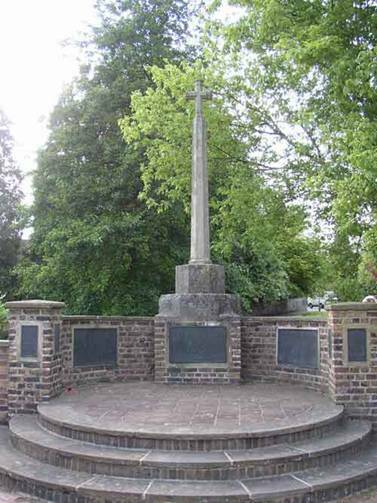 The War Memorial is situated adjacent to St Edith’s Well in the centre of Kemsing Village. It was designed by Sir Mark Collet’s architect Mr Godfrey Pinkerton and was built with voluntary labour and money raised by public subscription. It was dedicated by Lord Sackville on Easter Saturday March 26th 1921. 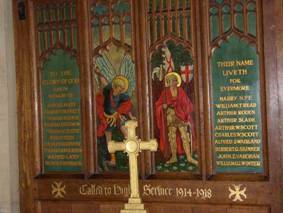 There are plaques also in St Mary’s Church, Kemsing. 144 men from the village went to War. 20 did not return. AVERY Harold G/7724, Private, 7th Bn. QORWK Regiment. Harold was born in Deptford in London, and the family moved to Kemsing in the late 1890’s where Harold’s father Horace was the village butcher. He joined up in 1915 and was killed on 8th July 1917 at the age of 23. He is buried in Dickebusch New Military Cemetery Extension at Ypres. BOAKES MM Thomas 81084 Private 8th Bn Canadian Infantry (Manitoba Regt). Thomas was the eldest of a large family which came to Kemsing in 1902 from London. He emigrated to Canada in about 1908, but joined up in December 1914 and returned to England. He took part in many battles and family stories relate that he was a sniper. He was wounded but returned to the front line where he was wounded again and died of his injuries in a casualty clearing stationed at the age of 25 on 30th April 1917. He is buried at Augibny Cemetery. He was posthumously awarded the Military Medal. BENNETT George Hicks Petty Officer, Royal Navy. Born in Plymouth on 3rd February 1881, George joined the Navy at the age of 12 following his Father’s footsteps as he had been a Royal Navy gunner. George became a ship’s carpenter and served through the First War being promoted to Petty Officer. He was eventually transferred to HM Drifter Catspaw which sunk on 31st December 1919. He was drowned along with the entire crew and is buried in Kviberg Cemetery in Sweden. He left a wife and three small children. DIMON Reginald Pierce 20415 Private 10th Bn. Yorkshire Regiment. Reginald was born in Kemsing on 28thNovember 1895, the youngest son and one of 10 children. He attended Kemsing School, and then worked as a gardener on a local estate. He died at a casualty clearing station in Armentieres on Wednesday January 26th1916 and is buried in the Cite Bonjean Military Cemetery. Thomas was born in 1900 in Bedford. His Father was a blacksmith and the family moved to Kemsing. However, his Father died, his mother re-married and Thomas joined up. He was killed on 17th September 1918 and is buried in Trefcon British Cemetery, Caulaincourt. FENN Phillip (born Philimon) 481 Private 6th Bn. QORWK Regiment. Phillip was born in Streatley on Thames in Berkshire in 1895. His father George was a Policeman, and the family came to Kemsing when his Father retired and became the first Steward of the Kemsing Working Men’s Club. He and his brother George were amongst the first to join up. Phillip was killed on 9th April 1918 during a time when the regiment were suffering a very heavy bombardment on the front line. He was 24 years old and is buried in Bouzincourt Cemty. on the Somme. GUNNER Charles William 19678 2/4th Bn. QORWK Regiment. Charlie Gunner was born in Seal in 1898 and attended Kemsing School where his name appears often in the Headmaster’s comments!. He was desperate to join up and after some trouble locally, became a soldier at the age of 18. He was killed on 4thNovember 1917 during the battle to capture Beersheba from the Turks. He is remembered on the memorial in the Beersheba War Cemetery, Israel. He was just 19 when he died. HOLMDEN Thomas James G 2207. Private 7th Bn. QORWK Regiment. Thomas was born on 3rd March 1883 and was part of a well known local family. He married Catherine Austen Merton on 20thOctober 1909 and had a daughter Pearl. He enlisted early, and was killed on 13th July 1916 aged 33, and is buried in Delville Wood Cemetery. His wife re-married, became Mrs Holcombe and moved from the village. LACEY Wilfred There are two possible Wilfred Lacey’s on the CWGC Site and I have been unable to confirm that he is either, however I believe he was a Lieutenant with 59th Div. Ammunition Co. 59th TM Battery RFA. If it is he, he was killed on 31st March 1918 and is remembered on the Arras memorial. MORRISON George Edward G/23138 Private 6th Bn. QORWK Regiment. George was born in 1898 and went to Kemsing School. He was killed on 30thNovember 1917 at the age of 19, leaving his parents and brothers including Charles who served through the war and returned home safe. Harry was born in Leigh, Tonbridge in August 1888. After a brief period in the Kings Royal rifles, he went with his Father to Australia in 1909. Harry and his Father soon parted however, and he ended up working on a sheep station in Gnowangerup in Western Australia. He worked on this station, Jackadup, for some time and became part of the family, as in his will, he left all his possessions to the station manager and his wife Thomas and Annie Taylor. He joined up on 3rd October 1916 and left from Freemantle on 29th December 1916. He was wounded in action on 29th September 1917, taken to a Canadian casualty clearing station and died of his wounds the next day, 21stSeptember 1917. He is buried in Lijssenthoeck Military Cemetary in Belgium. He was 29. READ William Thomas G/12355. Private 1st Bn. QORWK Regiment. Arthur was born in Cheshire in 1885 and it seems that they were a ‘railway’ family. He married a Kemsing girl, Ada Mary Waterman, and they had three children Benjamin, Fanny and Ernie. He died in a casualty clearing station on 29th December 1917 at the age of 32, and is buried at Bucquoy Road Cemetary, Ficheux, Pas de Calais. He was working as a labourer when he emigrated to Canada in about 1909 (did he go with Thomas Boakes above?). He enlisted in the 45th Bn on March 9th 1915, returned to England for basic training and left for France in March 1916, He was killed on 6th June 1916 during the battle for Hooge. He was 28 years of age and is remembered on the Menin Gate, having no known grave. SCOTT MM Arthur Ernest G/23885 Private 6th Bn. QORWK Regiment. Baptised in Kemsing on 7th November 1897, the youngest of the 4 Scott brothers of Noahs Ark. He joined up, was wounded and returned to France in December 1917, and was awarded the Military Medal for gallantry in March 1918. Arthur was killed on 7thSeptember 1918 at the age of 20 and is remembered in Peronne Communal Cemetery extension on the Somme, France. SCOTT Charles William 266397 Private 1st/1st Kent Cyclist Bn. Charles was the eldest of the Scott brothers and was born in Kemsing in 1887. He went to India with the 1st Kent Cyclist Bn. in 1916 and died of influenza on 11th November 1918, the day of the Armistice. One of their other brothers William was also wounded but survived the War. SKINNER Herbert George G/40846 Lance Corporal 16th Bn. Middlesex Regt. Born on 26th November 1878, Herbert worked a gardener. He was married to Ada Skinner of Sevenoaks and was killed on 31stMay 1917 at the age of 39, the oldest of Kemsing’s WW1 dead. Alfred was born on 2nd August 1892 and was baptised in St. Mary’s on 2nd October 1892. He worked as a Motor Driver and married Marion Elizabeth Beckley on 19th April 1914. Alfred survived the War, but died on 18th February 1919 in an Army depot in Fulham of Influenza and Pneumonia. He is buried in St. Mary’s Church graveyard, Kemsing. Edward was born in Seal on 15th August 1895, but baptised in St. Mary’s Church, Kemsing on 6th October 1895. He attended Kemsing School and afterwards worked in the gardens at Yaldham Manor. He enlisted early in the War and was killed by a rifle grenade on 9th March 1916. He has no known grave but is remembered on the Loos Memorial. He was 20 when he died. WINTER William Owen Jarvis Z/2857 Able Seaman Drake Bn RN Division RNVR Was born in 1890 and was a sailor in the Royal Navy prior to WW1. He was called from the reserve in 1914, but as the beginning of the war the Government had far too many sailors (between 20,000 and 80,000) William, like many others, became a part of the army, the 63rd Royal Naval Division. William died of wounds on 7thFebruary 1917 at the age of 26. He has no known grave but is remembered on the Thiepval Memorial. 300 men and women went into the services from the village. 20 men and 1 woman did not return. BALDWIN Phillip Andrew Private 6347218, 7th Bn QORWK Regiment. Phillip was born on 3rd December 1918 in Kemsing and attended Kemsing School. After leaving school, he worked at Kemsing Brickworks. He was called up on 30thOctober 1939, and with many other members of his Regiment was captured at Dunkirk. He was a Prisoner of War in Poland, in Stalag XXA at Thorun(which was not actually a camp, but a series of work places ranging from farms to factories). Although his exact fate is not known, he died on 18th February 1945 on the long march. He has no known grave and is remembered on the Dunkirk Memorial. Stephen Bushell was born oat Stourmouth Nr Canterbury on 9th September 1885. At the age of 13 he contracted diphtheria and a Doctor suggested that he join the Boys Naval Service. This he did, and served through the First War and was injured, and awarded the DSM. In 1918 he married Gertrude Bush and after leaving the navy he had many jobs and the family moved a great deal. However, they settled in Kemsing in 1934 where Mr Bushell became the school caretaker. Stephen was called up from the Reserve in 1939, and travelled all over the UK as a Chief Director Gun Layer. He was killed during an air raid on Hull on7th May 1941 with 7 other Navy men. He is buried in Hull Northern Cemetery. He was the oldest of Kemsing’s war dead, being 55 when he was killed. Henry Butler was called up in August 1939, and married Elsie in April 1941. He was killed on 1st August 1943 during the attack on Centuripe in Sicily when 43 men incl. a major were killed. He is remembered in Catania War Cemetery. Thomas was born on 27th August 1928, the eldest of 7 children. Thomas’ family came to Kemsing from London in 1940. He volunteered for service in 1943 and was killed in an accident whilst loading munitions on 18th June 1943. He was just 17 years of age and had been in the Navy for only a few weeks. He is buried in Haslar Naval Cemetary. Jimmy Davidson was born in 1920 and attended Kemsing School. He was called up in November 1939 and was killed during the night of 3rd September 1942 when the Company were involved with fierce fighting with the Italians at Alam Haifa. He was 22 when he was killed and is remembered on the Alamein Memorial, having no known grave. John Hadow was born in 1923, the younger son of Lt. Col. Arthur Hadow CMG, a first war veteran. John was taught to shoot by his Father and became a good shot. After Repton, he volunteered for the RAF in June 1941, and eventually found himself flying Westland Whirlwind aircraft. He was killed at Manston on 15th April 1943, practising dive bombing. He is buried in Margate Cemetery. He was 20 when he died. HODGES Colin 1892520 Driver, 265 Field Park Co. R.E. Colin was born on 23rd March 1919 and baptised in St. Mary’s Church. The fourth of five brothers, he attended Kemsing School and was called up in October 1939. He was killed on 19th May 1940 during fighting to retain the crossing of the Somme. He is buried in Abbeville Communal Cemetery, Somme. Charles was born in 1920 and was called up in 1939. He was killed when his ship was attacked when on convoy duty in the Mediterranean between Cyrenaica and Crete. Approx 156 men of the ships company of 500 were killed and buried at sea. He is remembered on Chatham Naval Memorial. Barbara Kentish was born on 11th March 1913 and worked as a School Secretary in Enfield after leaving finishing school at Lucerne Switzerland in 1931.At the outbreak of war she was visiting relations in E. Africa and could not return home. She volunteered for the FANY’s and in 1944 asked to be transferred for a draft to the East. She was killed when the ship on which she was travelling, the Khedive Ismael, was sunk off the Maldives on 12thFebruary 1944 with great loss of life. 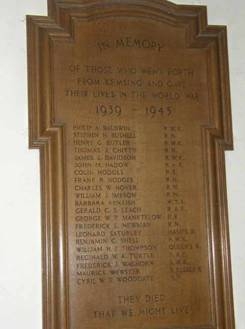 She is remembered on the East African Memorial in Kenya and on the FANY memorial in St. Paul’s Church, Wilton Place, London SW1. George was born on 1st October 1915 and baptised in St. Mary’s on 17th November 1915. He worked as a bricklayer, married Dora, moved in Godalming and had 2 sons. He had served in Iceland for 18 months before going to Italy where he was wounded. He met his brother Donald in Italy on the day before he was killed on 15thSeptember 1944 aged 29. He is remembered on the Cassino memorial. Fred Newman was born on 15th March 1904 in Battersea, and joined the Navy on 14th May 1920 at the age of 16. He married Dorothy Hodges of Kemsing on 28thAugust 1929. They settled in Kemsing and went on to have 3 children. He was called up from the reserve and died when his ship was torpedoed by a German U boat whilst escorting a convoy of ships bound for Malta on 23rd August 1941. He is remembered on Chatham Naval Meml. SATURLEY Leonard 5507284 Private 1/4th Bn Hampshire Reg. Leonard was born on 20th February 1920 and attended Kemsing School. He was a keen footballer and was employed at Sevenoaks Waterworks. He was called up in June 1940 and was killed by a shrapnel splinter on March 10th 1943 in N. Africa. He is buried in Medjez-el-Bab War Cemetery in Tunisia. Benny Shell came to Kemsing with his family in 1940 to escape the bombing in London. He joined up on 29th September 1940 and saw action in N. Africa. He was killed in the battle for Cactus Farm during the liberation of Tunis on 6th May 1943 and is also buried in Medjez-el-Bab War Cemetery in Tunisia. His Mother moved to Kemsing in 1939 and William married Annette in July 1942. He was killed on Friday 23rd October 1942 at El. Alamein. He is buried in the El Alamein Cemetery. He was 25 when he died. Arthur Turtle was born on May 14th 1916. His Father was a Doctor in London. Arthur joined the RAF on a short service commission in 1938 and married Brenda in 1939. He was killed when his plane was shot down on a night raid to Emden on 6thJune 1942. His body was washed ashore at Schiermonnikoog one of the Friesian Islands in the Netherlands, and he is buried there. WEBSTER Maurice 6399818 Private 2nd Bn Royal Sussex Reg.